Jessie has done it again! She's written an easy-to-read and down-to-earth, practical guide for getting along with your family. She doesn't pull any punches as she shares the joys and pains from her own family. It's a must-read experience of changing attitudes, forgiveness, and looking ahead to your future family.....and you will laugh when you meet Mr. Big Toe. - Bob Phillips, Licensed therapist, director emeritus at Hume Lake Christian Camps and bestselling author. Jessie uses stories and questions to help readers deal with the pain of their own family brokenness. And then she leads them through the process of finding forgiveness, redemption, perspective, and hope. We will be getting a copy for each of our girls at Shelterwood! - Jim Subers, President and CEO of Shelterwood Academy. In Family, Jessie is honest, relatable, and completely down to earth. She doesn't shy away from sharing the good, the bad, and the ugly about her own family and growing-up years. She gives you an honest inside peek that not many people are willing to give. 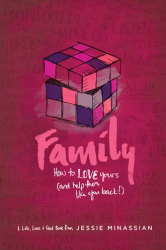 This book is filled with solid biblical truth and practical advice on how to love and live with your family well. - Kristen Clark and Bethany Baird, Founders of GirlDefined Ministries and authors of Girl Defined: God's Radical Design for Beauty, Fimininity, and Identity.